Formerly No 55 Hendford, it was built around 1830 and is shown on Watt's map of 1831 as well as Bidder's map of 1843. The building has simple, elegant proportions and a fine stone porch supported on Ionic columns. In 1851 it was the residence of glove manufacturer William Rawlings, his wife Ann, their five children, a governess and a domestic servant. In 1871 is was the home of coal merchant Uriah Burt, his two daughters Mary and Eliza, glove manufacturer son Sidney and son Henry, a merchant's clerk, together with two domestic servants. The situation was almost identical in 1881 except that son Sidney had left home and Uriah gave his occupation as 'Coal & Timber Merchant'. In 1891 Mary Burt was listed as a widow 'Living on her own means' with her step-daughter Mary and a general domestic servant. In 1901 73-year old Mary was living with her 75-year old brother William Mark and a general domestic servant. Villa now dispensing chemist. Circa 1840. 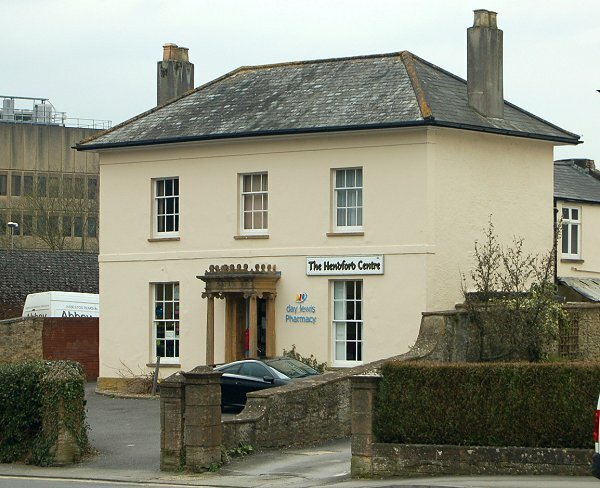 Stucco colour-washed with band courses at first floor and eaves, hipped Welsh slate roof with wide eaves overhang, and plain rendered chimney stacks at each end. 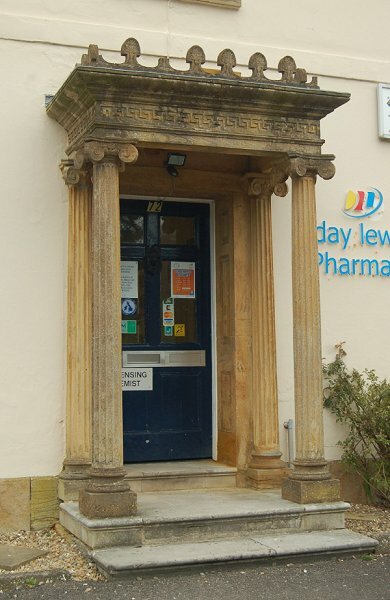 2-storeys of 3-bays; central projecting stone porch with pair attached and pair detached very slender fluted Ionic columns, the entablature having a Greek frieze and capped with acanthus acroterion type ornament; the former 6-panel door now half glazed. The windows 12-pane to ground floor and 9-pane to first floor. Stone front boundary wall has two stone gate piers with incised panel fronts and band of Greek frieze ornament and simple pyramidal caps. Once a fine residence in typical, if simple, Regency style, No 72 Hendford is now a pharmacy. Photographed in 2013. The striking porch with slim, fluted Ionic columns. This photograph highlights the Greek frieze of the entablature and the acanthus acroterion type ornament, now sadly somewhat deteriorated. Photographed in 2013.